Friday January 8 1909 I was busy with work all forenoon. Will had extra work about the place. I went down to Mrs [Boltons?] awhile in the afternoon. The weather a little more moderate. Saturday January 9 1909 I has a very busy forenoon with baking bread & cookies did a lot of sweeping and dusting as it was so warm and nice. Will went to town at 12.12 I finished up the work and did mending. I worked on my tatting all the evening. Sunday January 10 1909 It was a very cold day. I did the regular work and in the afternoon wrote to Lizzie Lindley and Nellie Lee. Hattie came out at 3.39 to stay till after supper and went home at 8.12. I read some after she was gone. Monday January 11 1908 It was an intensely cold cay. The men began work to take out ice. I worked at my tatting and read some. a nice long letter from Lydia. 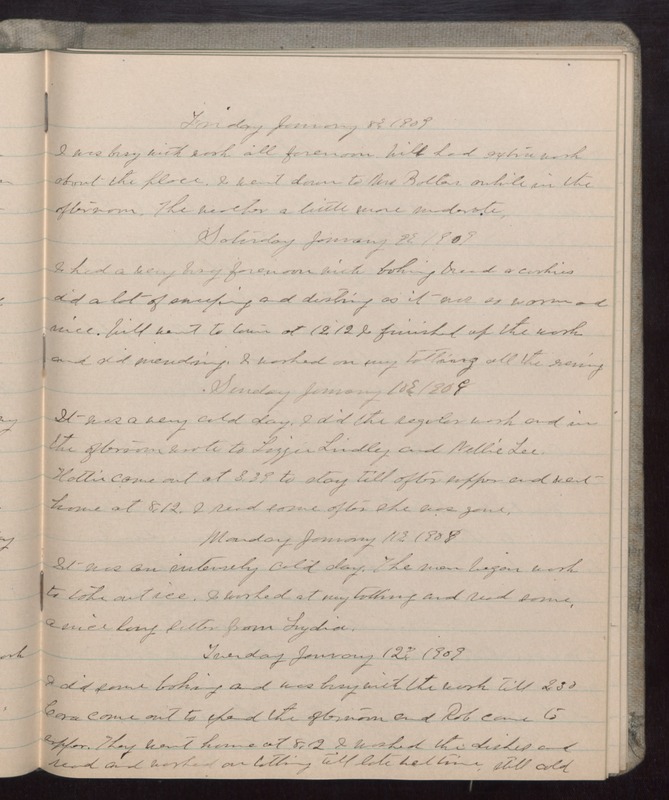 Tuesday January 12 1909 I did some baking and was busy with the work till 2.30 Cora came out to spend the afternoon and Rob came to supper. They went home at 8.12 I washed the dishes and read and worked on tatting till late bed time. Still cold.